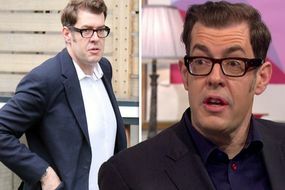 Alexander Armstrong and Richard Osman were on fine form today on Pointless. The hosts did garner a strong reaction from BBC viewers today however, when they found themselves unhappy with one particular answer. In round three, the remaining two pairs had to try and find the best hidden pudding from a selection of five images. The likes of Yorkshire Pudding and Sussex Pond Pudding made an appearance, but it was the final answer which got a big reaction. Pease Pudding scored 36 but it seemed Alexander wasn’t a fan of the usually northern delicacy. The accurate description didn’t sit too well on Alexander’s tummy and the host began to gag. While he contorted his face, the audience giggled, as his co-star admitted he felt similar.